So today is Thanksgiving Day. The day that I usually call “Turkey Day” because you really ought to be more thankful EVERY DAY and not just wait for the 3rd Thursday in November. And because really, these days, today has been more about how much food you can eat before your top button pops, before going out for a shopping frenzy at midnight in order to catch all of the sales. But then my friend, Undomestic Diva happened upon an organization called Feeding America. 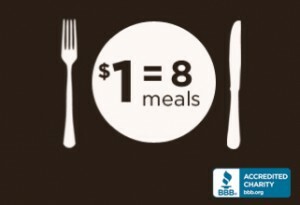 For just a buck, they can provide 8 meals. EIGHT OF THEM. Do you know what *I* can do with $1? I can’t even buy a bag of chips at work with a buck. So, when Undomestic Diva went all Faberge on us. But. She was right. If 8 followers donated $1, and those followers donated, that would be a lot of meals. Which is kinda my point. I’m not rich, by any means. But you know what? I have a couple of dollars in my pocket, and food on my table. Doesn’t seem like much, until you think of how many don’t. AND NOT just the homeless and impoverished. Some of your neighbors right there in the suburbs are also wondering where the next meal is going to come from. And just like that, I became even MORE grateful for the things that I have. And because I do have them, I can give to those who don’t. And so, I’m going to donate. Because, I can. Because I have to. Because there shouldn’t be hunger in a place where people have EATING COMPETITIONS (Which. Gross). Also? You should stop by Undomestic Diva and Jett Superior‘s place. THEY are the masterminds who are putting the giving, back in Thanksgiving day. And even though *I* don’t have a giveaway, they are giving away fancy gifts and prizes to those who do a little donating today. So have at it kids, Have yourselves a Happy ThanksGiving! P.S. If you need help, go here. When they said that they are Feeding America, they meant you too. This entry was posted in And now for a serious moment. Bookmark the permalink.